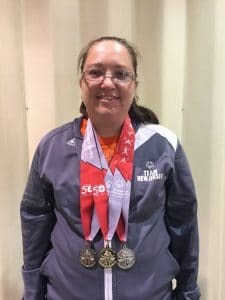 Project Freedom at Lawrence tenant Rebecca “Becky” Scheick earned three medals last moth at the Special Olympics. Becky brought home a Gold and two Silver medals. Becky crushed it in the Softball Throw earning herself the Gold medal! Her silver medals were for the 4 x 100 Meter Team Relay and the 100 Meter Dash. Project Freedom is very proud of Becky and all those Project Freedom tenants, consumers, and members who participated in Special Olympics.